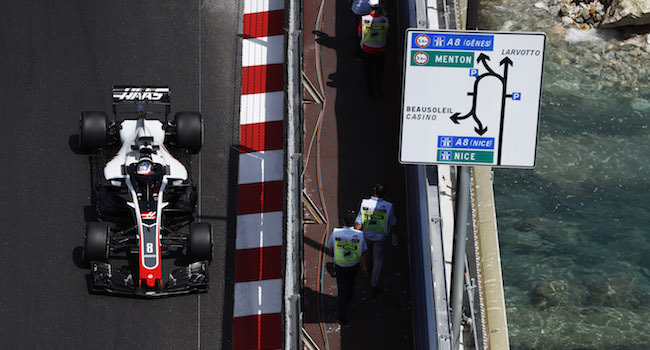 Haas F1 Team drivers Romain Grosjean and Kevin Magnussen qualified 15th and 19th, respectively, for the Monaco Grand Prix Sunday at Circuit de Monaco. Grosjean, however, will start 18th as he must serve a three-place grid penalty stemming from the preceding Spanish Grand Prix. Grosjean set the 11th-fastest time in Q1 with a lap of 1:12.930 to comfortably make the top-15 cutoff and advance to Q2. Magnussen was 19th quickest with a lap of 1:13.393. A local yellow flag in the final minutes of Q1 for Charles Leclerc’s Sauber going deep at Sainte Devote (turn one) compromised Magnussen’s last attempt at a quick lap. In Q2, Grosjean earned the 15th fastest time with a lap of 1:12.728. “Obviously, a disappointing qualifying for us, because this year we’re used to doing better than this," says Team Principal Guenther Steiner.